Sensei Tobey Bigelow is now the owner and the senior instructor at the dojo. 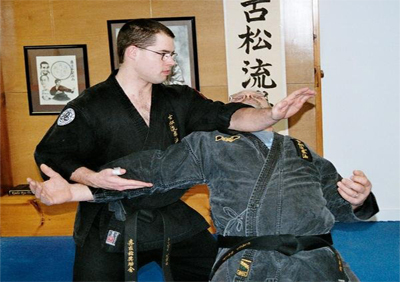 Sensei has been studying martial arts intensively since he was 15 years old, and holds dan (black-belt) ranks in Kosho Shorei Kai Kempo, Kempo, and Tae Kwon Do. He has extensive experience in a number of arts including Aikido, Muso Jikiden Eishin Ryu Iaijutsu, and Philippino stick and knife fighting arts as well as Shiatsu and Reiki healing techniques Tai Chi and Yoga. Sensei Bigelow is a direct student of Hanshi Bruce Juchnick, 22nd generation Grandmaster of Kosho Shorei Ryu Kempo. Sensei Tobey Bigelow defends against Sensei Clem Lounder.